Hurricane Michael left millions of acres of timber uprooted, broken, and prime for burning. In Florida, 72 million tons of timber – that’s 2.5 million log trucks worth of wood – were damaged across 11 Panhandle counties. In Georgia, 20.5 million tons of pine and 17.2 million tons of hardwood – totaling 37.7 million tons or 1.5 million truckloads of timber. Increased potential for fire starts. Property owners may try to burn debris without the proper safety measures in place and inadvertently cause wildfires. Increased severity of fires. The volume of dead and down fuels left in Hurricane Michael’s wake is likely to contribute to the number, intensity, and duration of wildfires over the next three to ten years. Typically, there are 4.87 tons per acre of available fuel in Florida. Now, the average is up to 58 tons per acre, a ten-fold increase in the amount of fuel on the ground. In the catastrophic area, there are over 100 tons per acre. Increased difficulty in fire suppression. Responding to more frequent and intense wildfires will require additional funds, equipment, and manpower. The Florida Forest Service expects initial attack and response to wildfires may be delayed as a result. Increased danger to firefighters. Fire managers anticipate a substantial surge in the difficulty of suppressing wildfires in both the wildlands and the wildland urban interface (WUI). Increased danger to homeowners. 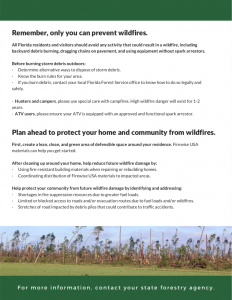 Using the mapping application SouthWrap, the Florida Forest Service has identified 233 communities at severe risk of wildfire damage as a result of the hurricane. Road access and escape routes will be affected and in some cases eliminated due to debris piles. And even areas not directly impacted by wildfires will be affected by smoke and ash. 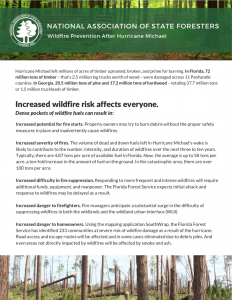 Check out NASF’s one-pager on wildfire risk and Hurricane Michael to learn how you and your community can work together to mitigate future wildfire damages. Have questions? Contact NASF Communications Director Whitney Forman-Cook at wforman-cook@stateforesters.org.